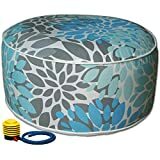 This Summer, when entertaining guests out on the patio, ensure you have extra seating when you quickly inflate these cool new Inflatable Outdoor Ottomans. 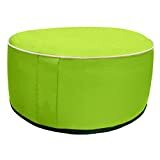 These inflatable colorful poufs are perfect for the porch, patio, poolside, kid's room, or anywhere on the go. Simply inflate by mouth or pump for quick extra seating and then deflate for compact storage or portability. 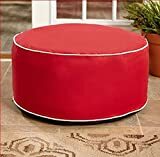 They're made from water-repellent, fade- and mildew-resistant outdoor fabric, come in many assorted colors, and can support up to 400 lbs.